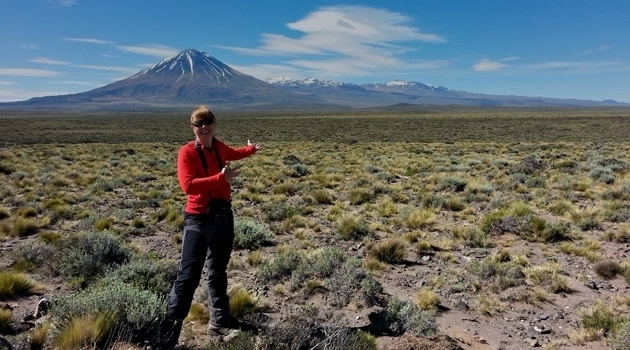 Steffi Burchardt in front of the volcanoe Payun in Argentina. There is no risk of an eruption when volcano researcher Steffi Burchardt is out on a research expedition. She studies extinct volcanoes that had eruptions millions of years ago. But life as a researcher out in the field is nonetheless full of drama and new discoveries. There is still a lot left to learn about volcanoes and what happens when magma from the Earth’s interior forces its way up out of the crust of the Earth in an eruption. Steffi Burchardt is one of the people involved in gathering that knowledge. Her favourite destination is Iceland and it was there that her most recent major discovery was made: that liquid magma can crack. It was the summer of 2016 when she and doctoral student Tobias Mattsson investigated an 11.7 million year-old magma chamber at the mountain’s surface. “We were going to make a 3D map of the magma chamber’s shape and see how the magma had flowed into the volcano. We were completely focused on finding out if the surrounding rock had cracked and how the magma, as viscous as peanut butter, had flowed in,” explains Burchardt. It was previously believed that it is only the rock around the magma chamber that can crack during a volcanic eruption, but when they took their measurements and stone samples, they discovered that there were strange cracks in the hardened magma. So they continued and found cracks in the rock that fit very well with the patterns they had previously seen, but still had no idea where they came from. Only after a few months at home did they cut the stone samples into 20-micrometre-thin slices and look at them under a microscope. “Then we suddenly understood that it was actually the magma that had deformed and cracked as it forced its way into the magma chamber,” says Burchardt. In November 2017, she received a grant from the Wallenberg Foundation to further investigate how liquid magma can crack. 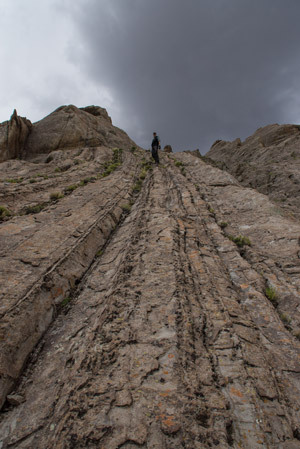 The aim is to understand how the crack formation can affect everything from predictions of volcanic eruptions to precious metal deposits and oil reservoir formation. Around the world, there are lots of volcanoes, some are active and others long since extinct. They are very dynamic systems that can be dormant for thousands of years, but then awaken and have an eruption within a few months. Nonetheless, many people settle near volcanoes, such as in Naples, Italy, as well as in the Philippines, Indonesia and Africa. The reason is the supply of geothermal energy that can be extracted from active volcanoes. Volcanism has also played an important role in Sweden. Here, the youngest volcanoes died out 100 million years ago in Skåne and the most significant volcanoes were active 1.9 billion years ago. At that time, what is now Bergslagen was a shallow ocean with large volcanoes and very explosive eruptions. That is how part of the continent we live on today was formed, Burchardt explains. In other parts of the world, volcanoes have been involved in forming oil reservoirs. The Norwegian oil deposits in the North Sea are one example, another is Argentina’s largest oil field, in northern Patagonia. There, Burchardt has been involved in a field survey as part of an international project. The project is looking at magma transport and magma chambers in sedimentary basins. These consist of layer on layer of sediment deposited over many millions of years – sand, clay and organic materials, including dinosaur bones. “It turns out that it was when magma forced its way in between the layers that the right pressure and temperature was achieved so that oil could be formed from organic material. So without the volcanoes, there wouldn’t have been oil there,” Burchardt explains. been important in oil reservoir formation. She was there to study an old volcano that went extinct five million years ago and where parts of the magma chamber are now at the surface. Hardened magma is harder than the surrounding rock, which is a bit softer and disappears by erosion. This can make an old magma chamber so easily accessible that researchers can walk around in it and measure the structure. They now use modern technology, such as a drone that circles around and takes pictures. 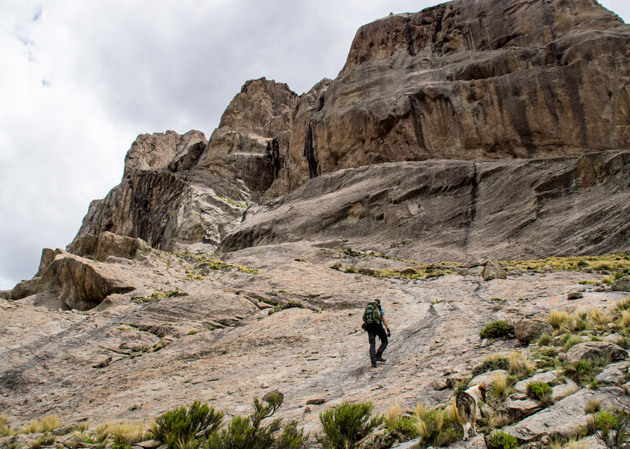 And Burchardt also looked for cracks in the magma in Argentina as well. Out in the field, they usually measure the structure with a geological compass or use a mobile phone app to make the same measurement digitally. Then they take the measurements and the map and build 3D models on the computer. The researchers also take stone samples to study at home, with a microscope for example. An important issue is how the cracks affect the magma chamber’s permeability and how much water can flow through it. The mere existence of the cracks indicates that the magma chamber is much more porous than previously believed. “This could mean that geothermal power plants can be more effective in such magma chambers since more water can circulate and the heat can more easily leave the hardened magma body,” says Burchardt. 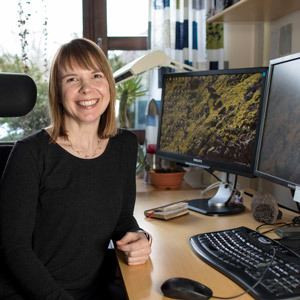 Steffi Burchardt has studied volcanoes for around 15 years. When she did her undergraduate degree in earth sciences in Göttingen, Germany, she went on an expedition to the Canary Islands, which are of volcanic origin. She likes to take photos and the computer is full of pictures of volcanic landscapes that are unlike any other. “The colours, the sharp contours... Even when the weather’s not so nice, it’s magical. 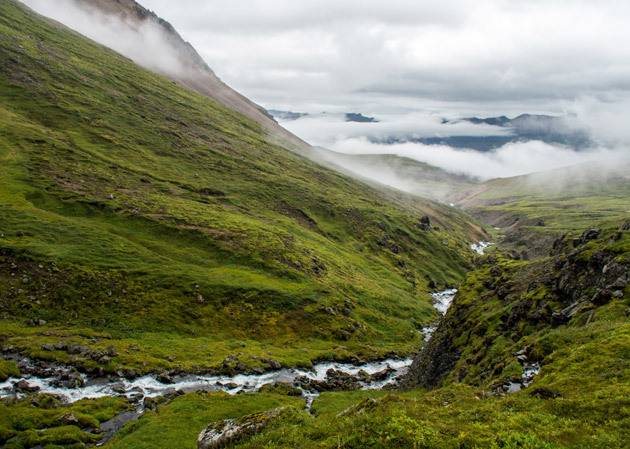 A field expedition to Iceland can last a week, but a journey to Argentina takes longer and being there demands more logistics. All food and water has to be transported. On their most recent expedition, they slept in tents and cooked over an open fire. There were no toilets and no showers and they washed in a small spring nearby. Last time they were there, a storm struck. It began to rain and hail, with hailstones the size of cherries, and suddenly the dry riverbed began to fill with water. They always travel in a group and are never alone out in the field. There is a risk of taking a misstep and breaking a leg, and communications with the outside world are often poor. “In Iceland, there’s not always mobile phone coverage and in Argentina, it’s hopeless, so it’s important to know the way back. It’s a bit more adventurous than sitting here in the office,” Burchardt says. The work at the office is also an important part of the research – here, she can twist and turn 3D models, measure and analyse. But for her, it is important to get out and be in nature. At her workplace, the Department of Earth Sciences, there are also seismologists who listen for earthquakes that can forebode a volcanic eruption. Every earthquake makes a crack in the ground and they are what the seismologists measure. If they are big enough, they can be measured even at a distance of several kilometres. This knowledge can also be used to predict volcanic eruptions. A volcano in south-eastern Iceland has recently shown activity, which has attracted some attention in the media. It is Iceland’s largest volcano in terms of both elevation and size, but there are not so many observations to go on. This is because it has only had two eruptions and the last one was in 1727–28. “We don’t know if it’s going to have an eruption or was just moving in its sleep. Since there was a lot of seismic and geothermal activity and heat under the glacier, it was thought that magma might be on the way up. But the magma may stop on the way into the volcano and it doesn’t necessarily have to rise to the surface. It’s calmed down a bit,” says Burchardt.